Of all the Marvel characters, Thor has had the roughest of rides. The first film was spectacular to look at but seem to take itself too seriously, while Thor: The Dark World was both unremarkable and unmemorable. Now we have Thor: Ragnarok, the third solo film for the God of Thunder and everything that was wrong with the first two films, they got right here. A whizz-bang, camp explosion of comedy and excitement that could have quite easily been called Carry On Flash Gordon! Asgard is in trouble. 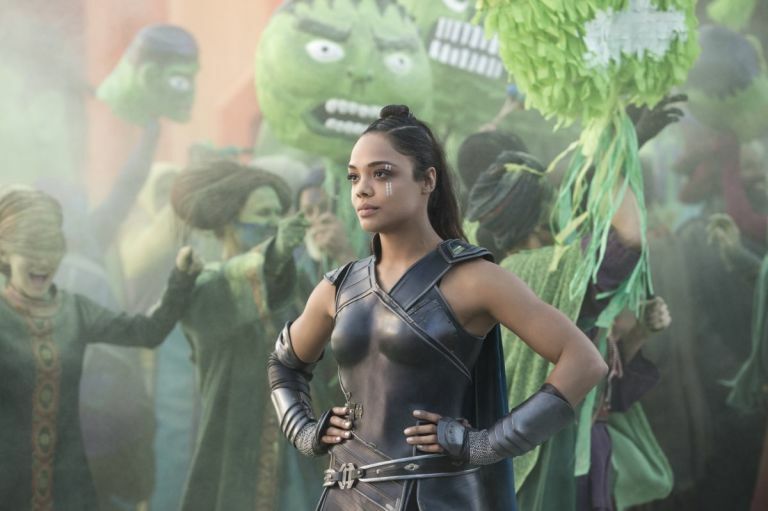 Hela, the God of Death has arrived to take over the planet while Thor is imprisoned over the other side of the universe without his mighty hammer and is in the hands of The Grandmaster, ruler of the planet and overseer of a gladiatorial battle which Thor is to play a huge part, taking on The Hulk. Afraid that Asgar will be destroyed, Thor has to recruit his former Avenger as well as his adopted brother, the scheming Loki and a former Asgarian, Valkryie, to escape his imprisonment and to return to his home planet. New Zealand born direct Taika Waititi, whose previous work has been the spoof vampire movie, What We Do In The Shadows and the excellent Hunt For The Wilderpeople, has gone all out for both the visuals and the humour, with every scene not only a delicious collection of colour and energy but brimming with wit and, on occasions, innuendo. From the very first scene, in which Thor is explaining what has been going on in his world since Avenger: Age of Ultron, nothing is taken seriously and the tone of the film is clearly set out. Forgetting the ludicrous plot contrivances that appear throughout, and after a brief visit with another Marvel superhero, Doctor Strange, the film really gets going when the evil Hela appears and accidentally lands on Asgard while Thor is propelled to another world, where the questions posed by their absence in Captain America: Civil War is explained, we meet a now fully talking Hulk, the gladiatorial hero of the world, which, for fans of the comic books, will link with the Planet Hulk stories. The film’s visual style takes a step up and you find yourself reminded of the 1980 camp classic, Flash Gordon. Even down to the electronic score by Mark Motherbaugh, you are almost waiting for a chorus of “Flash! Aaahhh!” or for Brian Blessed to scream “Gordon’s alive!” It certainly wouldn’t look out of place. The humour becomes broader and funnier, helping the overall enjoyment of the film, while never ignoring that this is a Marvel movie and there are areas which need to be met, like the huge battle scene for the finale. It’s there but delivered with a tongue rammed firmly in the cheek. The special effects department have a field day with its monstrous creations and it all ends in a very satisfactory manner. What makes the film really work is that you enjoy spending time with actors that you genuinely like, all of whom are giving everything they got and relishing each second of screen time. This is a scene-chewing paradise! 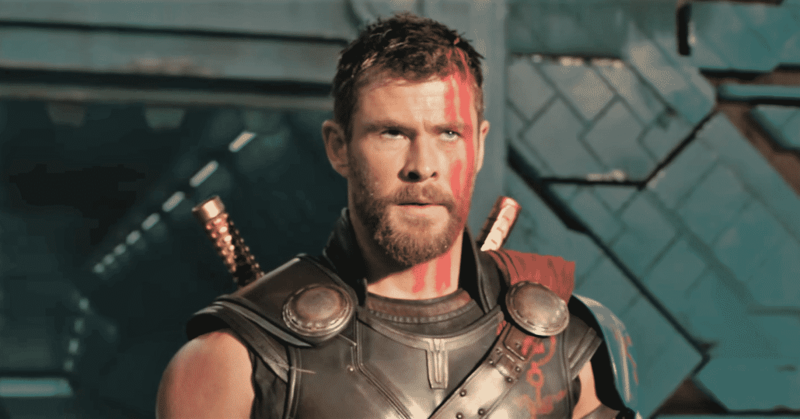 Chris Hemsworth has finally found the Thor he has been looking for: cheeky, self-deprecating and saying every serious line with a wry grin on his face. Tom Hiddleston, who for so long has been the king of the scene stealers as the odious Loki, is back on sly form but he has some tough competition this time. Mark Ruffalo has finally given a humanity to his Hulk while still perfectly underplaying his alter-ego, Bruce Banner. The new cast members are a delight. Cate Blanchett makes for a magnificent villain as Hela, once again saying far more with a look than most can say with a speech and she is allowed to let her incredible cheekbones almost steal the show. 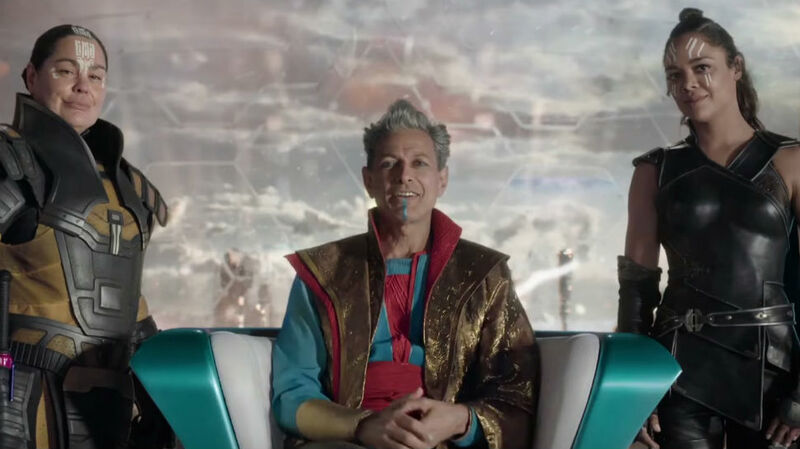 Jeff Goldblum, as the Grandmaster, is at his most Jeff Goldblum-ish and if there is one criticism, there isn’t enough of him, while Tessa Thompson gives us a gutsy, no-nonsense Valkryie who is a very welcome new edition to the universe. However, the real star of the film is director Taika Waititi as Korg, a rock monster with a quietly spoken line of wit that is hilarious and he steals the film from everyone. Thor: Raknarok is a blast with a distinctive style belonging to a talented director. A film that zips along at a terrific pace. If you can forgive the obvious plot holes and contrivances, you are in for a real ball and at last, Thor has been given the movie he so truly deserves. A perfect blockbuster and proof once again that the Marvel machine is a long way from slowing down. It’s also set the bar very high for other Marvel films to meet. Tremendous fun!